Capital gains come about from changes in the value of an asset. In other words, when you buy a home and over time it appreciates $50,000 in price, that appreciation is a capital gain. Just about everything you buy for personal use, such as home furnishings, home office equipment and your home are considered capital assets. Your investments, such as stocks and bonds, also fall under the capital asset umbrella. When you decide to sell any of these assets, the difference between your cost and the sale price represents the capital gain. Your cost, known as the basis, might be what you originally paid, but it could also be adjusted or "stepped up" to the asset value on the date of the asset donor's death, if you inherited the asset, such as a family vacation home. If you sell the asset for more than its adjusted basis, you'll have a capital gain. You can find out more about calculating and handling an adjusted cost basis in IRS Publication 551, Basis of Assets_;_ which in part explains, "Basis is generally the amount of your capital investment in property for tax purposes. Use your basis to figure depreciation, amortization, depletion, casualty losses, and any gain or loss on the sale, exchange, or other disposition of the property." Suppose you buy up 500 shares of XYZ stock at $10 each, for a total investment of $5,000. You make the purchase in January, and sell the stock in June for $5,200. You've just made a profit of $200, which the IRS considers a short-term capital gain. You then start completing your tax return and list your annual income of $85,000, which includes the $200 stock gain. Because of your total income amount for the year, you end up in a 24-percent income tax bracket. After paying 24 percent of your $200 to Uncle Sam, you're left with $152. However, suppose that you change your mind and hold on to your stock until January of the next year. At this point, your investment has increased by $400, and you sell the stock, taking your long-term capital gain. Your income, including your capital gain, puts you in the 15-percent tax bracket for long-term capital gains. You'll pay 15 percent tax on the $400 gain, netting you a $340 profit. By hanging on to your investment for a full year, you've made more than double the net profit by taking advantage of the more favorable long-term capital gains tax. What is considered a long-term capital gain? Any gain on the sale of an asset that you've held for more than one year. Short-term capital gains come from any assets that you buy and sell within the same 12-month period. You'll pay taxes on short-term capital gains as if they were part of your regular income, which is always a higher tax rate than the long-term capital gains rate. The government gives taxpayers a tax break on long-term capital gains to encourage buying and holding investments for longer periods of time, which helps to stabilize the economy. Speculating, or flipping investments in less than 12 months may reward you with a quick profit, but you'll have to offset that with the higher short-term capital gains tax rate. If your total income for the year falls into the 10-percent or 15-percent ordinary income tax brackets, you'll enjoy a 0-percent tax on your net capital gains. For higher income brackets, you'll typically pay 15 percent tax on your net, long-term capital gains. If your taxable income exceeds the 39.6-percent threshold for the highest tax bracket, you'll pay a 20-percent tax on your net long-term capital gains. What Counts as Capital Gains? Any profits that you earn from selling assets are typically called capital gains. This includes selling physical or tangible assets including cars, artwork, boats and anything else that you sell for more than the original price you paid. There is one caveat, and that is in the case of possessions such as a standard car; it depreciates over time, so it's rare that you'll make a profit on the sale and trigger any capital gains tax. When you sell real estate, you will also pay tax on capital gains, although the IRS allows some exemptions to the tax for your principal place of residence. If you hold dividend-paying stocks in your investment portfolio, the dividend payments also qualify as capital gains. If your portfolio includes a good number of dividend-paying stocks, you could benefit from working with a financial planner to reinvest that money in a way that helps you reduce your tax bill. Are Capital Gains Unearned Income? The IRS considers any money you make from sources other than your employment as unearned income. This includes dividend income, taxable interest, alimony and unemployment income. These forms of income aren't derived from your efforts. The IRS considers the income from your wages, tips, a salary or any other form of taxable compensation as earned income. Unearned income receives a different tax treatment than earned income. While it won't be subject to any forms of the payroll tax, you will have to pay capital gains tax on your unearned income. And just in case you were wondering, you won't be able to contribute any of this unearned income to an IRA. Some forms of unearned income, such as the proceeds from a life insurance policy, won't require you to pay any taxes at all on the money. Other forms of unearned income, although less common, include gifts, lottery winnings and any money coming from an inheritance once the estate has been settled. As an example of unearned income and capital gains, say that Joe has earned $85,000 this year in salary and bonus, plus another $6,000 in dividend income from his stock portfolio. While his salary and bonus are earned income, the $6,000 dividend money is considered capital gains and also unearned income. Once Joe retires, he'll get money from his retirement accounts and Social Security. These payments are also unearned income and will be taxed accordingly. When calculating your investment income, the capital gains tax is applied only to your net income from Investments. If you have had more losses than gains, you won't owe any taxes, and you'll get a usable tax credit for your net investment loss. This applies to both long-term and short-term capital gains. However, the IRS does not allow you to take a capital loss on your personal-use property such as cars or your primary residence. 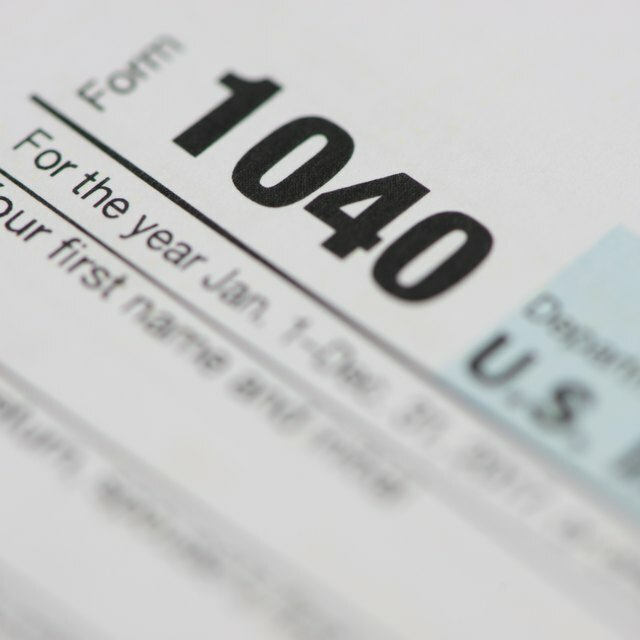 If you find yourself in a position where your net investment results in a loss rather than a capital gain, you can claim the amount of your loss on line 13 of your IRS Form 1040 and use it to lower your income. You can apply losses in amounts less than $3,000, or $1,500 if you are married, filing separately. Your net loss will be the result of combining both short-term and long-term capital gains or losses, and you will need to show the details of these amounts on Schedule D of Form 1040. If you have several transactions, you can add the details and do the calculations on Form 8949, Sales and Other Dispositions of Capital Assets, and carry the results of this worksheet over to your Schedule D.
If your net loss for the year exceeds $3,000, you can carry this loss forward to future tax years. The IRS provides a Capital Loss Carryover Worksheet, which you can find in IRS Publication 550, Investment Income and Expenses or in the instructions for Form 1040, Schedule D. Either of these methods can help you figure out the amount of loss that you can carry forward to future years. The recent changes in tax laws have left the long-term capital gains tax rate unaffected, and short-term capital gains are taxed as ordinary income as they've been in the past. The overall amount of tax paid on short-term gains may change, but it will be caused by the changes made to the IRS tax rates in the seven existing tax brackets. Under the new tax rules, most taxpayers will end up owing less money on their annual return, according to analyses performed by the Tax Policy Center think tank. Additionally, although a "first-in, first-out" method was proposed in the Senate tax bill to calculate the cost basis for investments, this provision did not make it into the new tax law. How Do Taxpayers Minimize Capital Gains? Many different strategies exist to minimize capital gains; among them, hanging on to your investment for a full year, which allows you to more than double your net profit by taking advantage of the more favorable long-term capital gains tax. However, your best bet is to discuss with your financial advisor or CPA how to best manage your situation. If you have capital gains, you will want to invest in more than one tax-saving strategy. One of the easiest ways to minimize long-term capital gains is to take advantage of the 0-percent tax rate that you'll receive if your ordinary income falls under $77,200 for Married, filing jointly; or $38,600 if filing Single. Once you factor in the $24,000 standard deduction, assuming you don't itemize expenses on your tax return, you can make over $100,000 in income while still taking advantage of the 0-percent, long-term capital gains tax rate. For retirees who happen to have a year with an abnormally low income while waiting for their pension or deferred compensation to kick in, being in the lower tax brackets offers an opportunity to sell off stock positions and other assets to maximize the 0-percent, long-term capital gains tax rate. Some people may want to sell off losing stocks in their portfolio, and if you can offset any capital gains with a larger amount of capital losses, this is the time to harvest those losses and sell. You can use your home as a capital gains tax break, by excluding $250,000 of capital gains on your primary residence. If you're married, you'll get to exclude a whopping $500,000 from the capital gains tax. If you've made improvements to the home, such as a new bathroom, kitchen or roof, keep the receipts so that you can update your home's cost basis and shrink your capital gains amount. If you're thinking of moving soon, consider moving to a state that has tax-friendly laws. For example, Florida and Nevada do not have state income tax, so wait until you relocate to sell off your assets so you won't be triggering any capital gains tax at the state level.